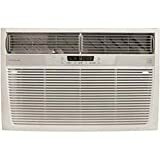 Frigidaire's FFRH1822R2 18,500 BTU 230V Median Slide-Out Chassis Air Conditioner with 16,000 BTU Supplemental Heat Capability is perfect for a room up to 1,050 square feet. The slide-out chassis is designed for either window or wall installation. In addition to cooling, this versatile unit also offers supplemental heat capability, providing you with an additional heat source to your main heat source when outdoor temperatures are above 45 degrees Fahrenheit. 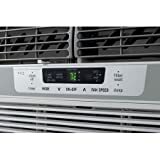 It quickly cools the room on hot days and quiet operation keeps you comfortable without keeping you awake. Features include electronic controls, full-function remote control with heat, 8-way air direction control and multiple speeds. Plus, the washable mesh filter with clean filter alert reduces bacteria, room odors and airborne particles creating a comfortable environment. This unit requires a special 230V electrical outlet and will not operate with a standard 115V household electrical outlet. 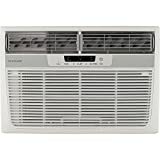 Frigidaire's FRA126CT1 12,000 BTU Compact Window Air Conditioner with Temperature Remote, is perfect for medium to large size rooms up to 640 square feet. It also has electronic controls with a temperature sensing remote giving you the choice of controlling the temperature with the remote or at the unit. The clean air ionizer and antimicrobial filter reduces bacteria, room odors, and other airborne particles for a comfortable environment. 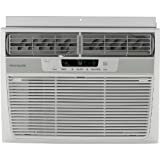 With Energy Star efficiency, this unit provides savings along with cool, quiet comfort. 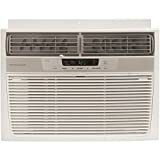 Frigidaire's FFRH1222R2 12,000 BTU 230V Median Slide-Out Chasis Air Conditioner with 11,000 BTU Supplemental Heat Capability is perfect for a room up to 550 square feet. The slide-out chassis is designed for either window or wall installation. In addition to cooling, this versatile unit also offers supplemental heat capability, providing you with an additional heat source to your main heat source when outdoor temperatures are above 45 degrees Fahrenheit. It quickly cools the room on hot days and quiet operation keeps you comfortable without keeping you awake. Features include electronic controls, full-function remote control with heat, 8-way air direction control and multiple speeds. Plus, the washable mesh filter with clean filter alert reduces bacteria, room odors and airborne particles creating a comfortable environment. This unit requires a special 230V electrical outlet and will not operate with a standard 115V household electrical outlet. 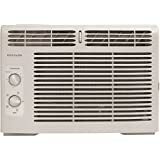 Frigidaire's FRA123CV1 12,000 BTU 115-Volt Window-Mounted Compact Air Conditioner is perfect for rooms up to 640 square feet. It quickly cools the room on hot days and quiet operation keeps you cool without keeping you awake. Ready-Select electronic controls allow you to set the comfort level to your preference, while the convenient temperature readout displays the set temperature. The full-function remote control allows you to precisely control the temperature and fan speed from across the room. 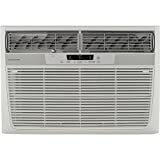 The multi-speed fan features three different fan speeds for more cooling flexibility and the 8-way comfort control design allows you to easily control the direction of the cool air, wherever the unit is mounted. Plus, the fresh air vent and exhaust controls remove odors and freshen the air while the antibacterial filter reduces bacteria and other airborne particles for a cool, comfortable environment. 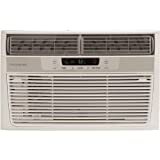 12,000 BTU 115-volt window-mounted compact air conditioner quickly cools a room up to 640 sq. ft.